Interfaith Celebrities: Dave Barry, The Ten Commandments, and a Passover Bonus! 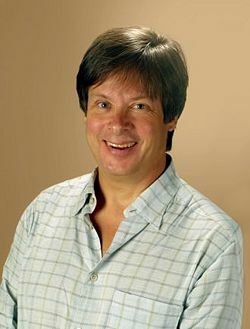 On April 2, 2011, Pulitzer Prize winning writer Dave Barry appeared on NPR’s Wait, Wait, Don’t Tell Me. It’s a humor-laced, weekly quiz program that concentrates on the past week’s news events. The April 2 show was recorded before a live studio audience in Miami. Barry came on to discuss life in the Miami area, among many other topics. Barry settled in Miami in 1983 after the editor of the Miami Herald’s Sunday magazine, Tropic, hired him to write a column for the magazine. Barry’s column appeared in the Miami Herald until 2005. Since then, he has written collections of essays and other books, including comic novels. While close to his father, a Presbyterian minister, Barry has not been religious as an adult and describes himself as an atheist. He had one child, a now adult son, with his first wife. In 1996, he married Miami Herald sportswriter Michelle Kaufman, who is Jewish. They have one child, a daughter named Sophie, who was born in 2000. HOST PETER SAGAL: Right. With all these things crawling in and around and all these other madnesses, do you ever get tempted to leave Florida and go someplace sane? BARRY: No, because my wife won’t let me. BARRY: No, my wife is really rooted here. She’s Cuban Jewish. Juban, they call them. BARRY: Yes, there are Jubans in the audience. They didn’t come over on rafts, they parted the Caribbean. The full text and audio of the interview is available here. Barry’s most recent collection of essays, I’ll Mature When I’m Dead (2010), contains an interesting and funny essay entitled “Judaism for Christians.” It includes more observations about Passover. In this essay, Barry writes that his wife, Kaufman, like many American Jews, is an irregular synagogue-goer. Mostly, she attends on the more important Jewish holidays. Barry describes accompanying her and his daughter to the synagogue as well as his favorite part of the Passover seder. You may read the entire essay online. Every year, ABC broadcasts the 1956 film, The Ten Commandments, starring Charlton Heston as Moses. It usually beats all the competition in the ratings. This year, it will air the day before Easter, Saturday, April 23, beginning at 7 p.m., EDT/PDT. Enjoy the new Blu-Ray trailer for the 1956 classic film, The Ten Commandments. Fraser Heston, by the way, was three months old when he appeared as baby Moses in the 1956 film. Charlton Heston, who played Jewish characters in both The Ten Commandments and in the 1959 Oscar winning film Ben-Hur, was a devout Christian. He was also a big supporter of Jewish and Israeli charities. The film, as most people know, is not a shot by shot re-creation of the account of Moses’ life or of the exodus from Egypt as told in the Bible. The film’s creators took many liberties dramatizing the Biblical account. Even so, when it debuted, its special effects were considered to be groundbreaking and audiences loved the film. Edward G. Robinson (as the evil Dathan) and Olive Deering (as Moses’ sister, Miriam) were the only Jewish actors with important roles in The Ten Commandments. Yul Brynner, who played the Pharaoh of Egypt, had one Jewish great-grandfather. Robinson (1893-1973), most famous for his early gangster roles, was born Emanuel Goldenberg in Romania and came to the United States in 1903. Always proud to be Jewish, he was also a highly cultured man due to a rigorous program of self-education. At one time, he owned one of the finest collections of paintings in the world. Deering (1918-1986), born Olive Corn, received good notices for her stage work in the 1950s and 60s, but had a limited film and television career. She married Jewish actor/director Leo Penn (1921-1998), the father of actor Sean Penn (born 1960), in the early 50s. They had no children and Penn went on to marry (1957) Sean’s mother, Italian/Irish Catholic actress Eileen Ryan, now 82, after his divorce (1952) from Deering. He was married to actress Kim Stanley (1919-86) from 1958-1964. Stanley was one of the most acclaimed Broadway stage actresses of the 1950s and 60s. She was twice nominated for an Oscar (Seance on a Wet Afternoon and Frances), although she made only a handful of films. Almost everyone has heard Stanley’s voice. She was the unseen narrator of the opening and closing scenes of To Kill a Mockingbird (1962). Stanley converted to Judaism prior to marrying Ryder. Their daughter, a practicing Jew, told a recent scholarly biographer of Stanley that her mother continued to observe some Jewish holidays until her death. An amusing sidelight about Olive Deering and the making of The Ten Commandments is found in the 1989 memoir, Which Reminds Me, by the late, Jewish actor Tony Randall, born Arthur Rosenberg. For more on Shalom Sesame, and the special episode “It’s Passover, Grover!” on PBS, visit Shalom Sesame’s home page. For even more information about the series as well as its celebrity guests, check out this article in USA Today.